Without a doubt, there will be a bustle of activity this weekend at Winterthur” (Route 52, Wilmington, Delaware, 302-888-4600, www.winterthur.org) with the climax being the Winterthur Point-to-Point Races — an event that has become one of premier attractions in the Brandywine Valley each year. This year’s 38th annual staging of the event is scheduled for May 8 from 10:30 a.m.-4 p.m.
Post time for the first steeplechase event is the Isabella du Pont Sharp Memorial Maiden Timber Race at 2 p.m. — after Sofi Tyler sings the National Anthem at 1:50 p.m. The Point-to-Point’s other featured races will be the Winterthur Bowl at 2:30 p.m. the Vicmead Plate at 3 p.m. and the Middletown Cup at 3:30 p.m.
Tickets are $50 for adults and $15 for youth (ages 12-20). It’s not just horses at Winterthur this weekend, but classic cars, too. “Historic Autos at Winterthur” (which is included free with museum admission) will have its first installment for 2016 on May 7. This attraction provides visitors with the opportunity to see a variety of vehicles from the past that have been maintained in pristine condition. There will be different displays every Saturday through the month of May. The displays are open from 10 a.m.-4 p.m. and are accompanied at 1 p.m. each Saturday by related lectures in the museum’s Rotunda. “Ten Years of Excellence: Select Vehicles Displayed at Winterthur, 2006-2016” on May 7. Select Vehicles Displayed at Winterthur, 2006-2016” with a 1907 Autocar, 1918 Buick E45 Touring, 1926 Rolls-Royce Silver Ghost, 1928 Mercedes S, two-door touring model, 1929 DuPont Le Mans Speedster, 1931 Chrysler M6 Roadster, 1931 Jordan, 1931 Buick Wagon Series 90 Model 9, 1932 Packard, 1935 Cadillac convertible, 1936 Packard convertible, 1948 Jaguar Mark IV Saloon, 1955 Cadillac, 1956 Packard Patrician, 1959 Cadillac, 1959 Rolls-Royce Silver Cloud, and a Winterthur Rolls-Royce. 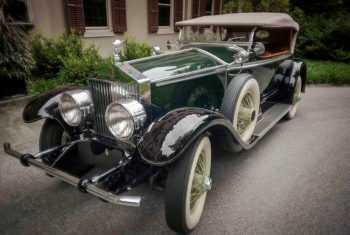 The theme for May 14 will be “American Pre-war Luxury Brands, from Packard to Cadillac,” with a 1910 Pickard, 1927 Cadillac 314 Phaeton, 1928 Pierce Arrow Limo, 1929 Packard Opera coupe, 1930 Cord L-29 Cabriolet, 1930 Rolls-Royce Phantom Suburban, 1933 Auburn, 1937 Packard, 1938 Packard 1604 coupe, 1940 Packard, and a Winterthur Rolls-Royce. “The Personal Automobiles of Ruth Wales and Henry Francis du Pont” will be presented on May 21. The line-up of autos includes a 1918 Cadillac, 1942 Cadillac Fleetwood Model 7533 Imperial sedan, 1941 Cadillac Town Car Landau, 1940 Buick Limited 90L limo, 1957 Cadillac Series 62 Coupe de Ville, 1957 Cadillac Series 75, 1931 Buick Wagon Series 90 Model 9, 1942 Cadillac 7533F, and a 1959 Rolls-Royce Silver Cloud. The final installment will be “Cars of the 1950s: Winterthur Museum Opens to the Motoring Public” on May 28. Featured vehicles will be a 1950 Ford custom convertible, 1950 Buick Special, 1950 Studebaker Commander, 1953 Buick Special 45R, 1954 Buick Skylark convertible, 1955 Buick Roadmaster two-door hardtop, 1955 Cadillac, 1955 Pontiac Starchief, 1956 Chrysler, 1956 Continental, 1956 Corvette, 1956 Ford Thunderbird convertible/hardtop, 1956 Mercury Montclair hardtop, 1956 Studebaker, 1957 Chevrolet Bel Air, 1957 Chevrolet convertible, and a 1959 Plymouth Sport Fury. From 1916 to 1969, hundreds of guests came to Winterthur for glittering social occasions hosted by the du Ponts. They arrived in a wide variety of automobiles that reflected the latest in design and fashion. These weather-permitting displays honor this tradition. The displays are free for members and included with admission. The lectures are free for members and students and included with admission. May 7, Winterthur will also be presenting “Azaleas and Bluebells Day.” Visitors to the site will be able to enjoy the spectacle of thousands of azalea blossoms and acres of wildflowers. The day’s events will include the opportunity to take photos with Mom in Azalea Woods, shop at plant sales at the Museum Store, and participate in guided and self-guided tours through the azalea display. May 7 also is the opening Winterthur’s new exhibition “Embroidery: The Language of Art,” which looks at how the creation of embroidered objects fits into the changing definitions of art, craft, and design throughout the 17th, 18th, and 19th centuries. The exhibition will be open through June 2, 2017. Another important recent acquisition is a needlework picture after Benjamin West’s famous painting entitled Penn’s Treaty with the Indians. Recent research on this work has revealed that the artist, Margaret Ansell, exhibited this picture at the 1776 Society of Artists Exhibition in London alongside paintings, prints, and other works of art. Last but not least is Winterthur’s current major exhibit — “Made in the Americas: The New World Discovers Asia.” The landmark exhibition, which is running through January 8, 2017 in the Winterthur Galleries, takes a look at the history of globalism and the colonial Americas. “Made in the Americas: The New World Discovers Asia” is the first large-scale, Pan-American exhibition to examine the profound influence of Asia on the arts of the colonial Americas. More than 80 works — including fine furniture, textiles, ceramics, silverwork, and paintings dating from the 17th to the early 19th centuries — relay the complex story of how craftsmen throughout the hemisphere adapted Asian styles in a range of objects. Admission to Winterthur is $20 for adults, $18 for seniors and students, and $5 for children (ages 2-11). Kennett Square will be a hotbed of activity all weekend beginning with the Kennett Square Farmers Market. Every Friday, the market, which is located along East State Street between Broad and Union Streets, will be open from 2-6 p.m.
Kennett Square’s Art Stroll is a monthly celebration of the local art scene. Attendees are encouraged to stroll along the tree-lined streets and browse the many businesses that stay open late. The Art Stroll runs from 6-9 p.m. on the first Friday of each month. As an added attraction, there will be free parking after 5 p.m. in the downtown parking garage and at any street meter. 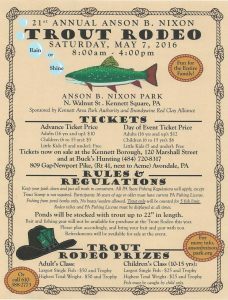 On May 7, the 21st Annual Anson B. Nixon Trout Rodeo (610-388-2773), which is sponsored by the Red Clay Valley Association and the Kennett Area Park Authority, will be staged at Anson B. Nixon Park from 8 a.m.-4 p.m. Ponds will be stocked with trout up to 22 inches for youth and adult fishing. For more information on this weekend’s events in Kennett Square, call (610) 444-8188 or visit www.historickennettsquare.com. On May 6, the West Chester Chamber Gallery Walk (http://www.downtownwestchester.com/view_program.php?id=329) will be held in downtown West Chester. The event features an eclectic mix of gallery receptions and one-night exhibits — a combination that makes Gallery Walk an evening of fun and surprises. The free event, which is presented by the Greater West Chester Chamber of Commerce, will run runs from 5-9 p.m.
Gallery Walk include paintings in watercolor, acrylic and oil as well as sculpture, photography, jewelry, ceramics, textiles and more. There will be free parking for visitors to Gallery Walk at the meters and in the parking lots after 5 p.m. There are hundreds of options for ways to celebrate Mothers’ Day such as special brunches and dinners at local restaurants, garden tours, theater shows and more. If you’re looking for something completely different to do with your mom this weekend, take her out to tour a caboose. 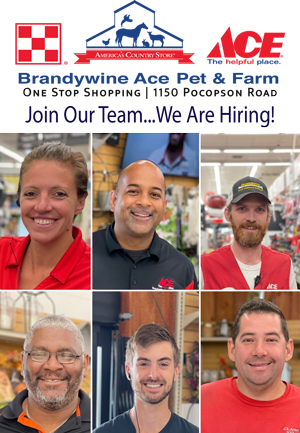 If you’ve ever driven past Brandywine Ace Pet & Farm (1150 Pocopson Road, West Chester, 610-793-3080, www.acehardware.com/local/brandywineace), you’ve probably seen a caboose sitting alongside the building. And, if you’ve seen this caboose, you might have wondered why a caboose is sitting all by itself next to a hardware store with no other rail cars and no signs of rail activity. Well, here’s your chance to find the answer to the question of why the red caboose is at Brandywine Ace rather than bringing up the end of a moving freight train. Just take mom — or go solo — to the site for a special caboose tour. On May 8, Brandywine Ace & Pet is presenting a “Caboose Tour” from 3-5 p.m. Visitors will be able to walk inside the caboose and ask Father Walter Benn questions about his caboose that has been completely restored. Tours will also be held on May 15 from 3-5 p.m. and May 19 from 3-6 p.m. 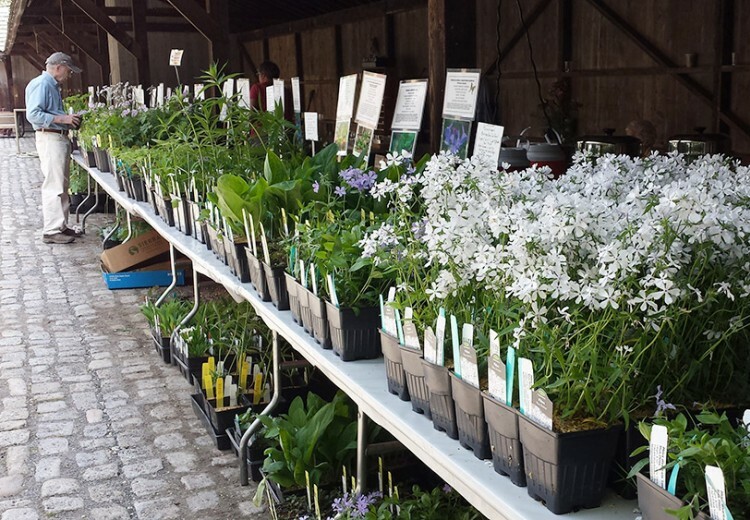 The annual “Wildflower, Native Plant & Seed Sale” is this weekend at the Brandywine River Museum. The well-attended annual event will be held on May 7 and 8 on the Museum’s grounds along the banks of the Brandywine Creek in Chadds Ford. Visitors to the “Wildflower, Native Plant & Seed Sale” will be able to select items from a wide array of categories and varieties. No plants are collected from the wild and most of them are propagated by Conservancy volunteers. Many of the plants and seeds on sale at this weekend’s event are difficult — and some are impossible — to find in retail garden centers. Organically grown vegetable plants from Two Gander Farm will also be available. As an added attraction, Conservancy staff and volunteers will be available to answer questions and provide planting and horticultural information. Local botanist Janet Ebert will lead a tour of the wildflowers around the Brandywine River Museum of Art on May 8 from 10-11 a.m.
All proceeds from the sale benefit the Conservancy’s diverse and beautiful gardens. Admission to the plant sale is free. For a complete list of the flowers and seeds available for purchase, go to http://www.brandywine.org/sites/default/files/media/2016%20Expected%20Plant%20Sale%20Availability.pdf. Usually, the Wilmington Flower Market, which is held in early May every year, is an event that almost always seems to bring wet weather. So, it comes as no surprise that rain showers have been forecast for this weekend. This year, the 96th Annual Wilmington Flower Market returns to Rockford Park (Park Drive, Wilmington, Delaware, 302-995-5699, www.wilmingtonflowermarket.org) on May 6 and 7. The Flower Market, which always runs in conjunction with Mother’s Day, benefits over 50 children’s charities in Delaware. The 2016 Wilmington Flower Market, which is free and open to the public, will be held today from 10 a.m.-8 p.m. and Saturday from 10 a.m.-7 p.m. each day. As is the tradition, the event features crafts, booths, rides, food, fun, live entertainment and plenty of flowers. The music line-up for May 6 features Jungle John, Kevin McCove, Nadjah Nicole and Karmin. On May 7, the festival will present Cher’s Playground, The Quixote Project, Sofi Tyler, Tangina Stone, High Dive Heart and Johnny Rzeznik. Wilmington Garden Day, a springtime tradition in the Brandywine Valley, will host its 69th annual tour on Saturday, May 7, from 10 a.m. to 4 p.m. Featuring both houses and gardens, this is a rain-or-shine event. 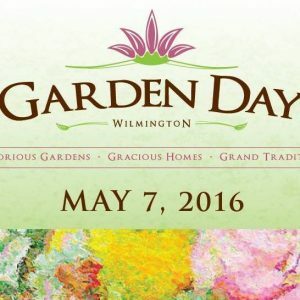 Wilmington Garden Day has been using its proceeds to benefit underserved children in Delaware for 47 years. Tickets for this year’s tour are $30. On May 7, one of Montgomery County’s most popular historic sites will celebrate the arrival of May. Pottsgrove Manor (100 West King Street, Pottstown, 610- 326-4014, www.historicsites.montcopa.org) is hosting a Colonial May Fair on May 7 from 11 a.m.-4 p.m. The event will feature 18th-century entertainment, including May Pole Dancing Milkmaid’s Garland Dances along with performances by Tucker’s Tales Puppet Theater, acrobat Signora Bella, the Tapestry Historic Dance Ensemble and Levram the Great. Signora Bella “the Great Italian Equilibrist” has entertained audiences of all ages since her arrival on the eastern seaboard 10 years ago. Raised in northern California as Jody Ellis, she is a circus veteran whose solo act focuses on the tradition of the traveling performers of the 17th, 18th and 19h centuries. The Tapestry Historic Dance Ensemble is dedicated to the research, re-construction and performance of historic social dance. The group’s repertoire encompasses historical eras from the late 15th through the mid-19th centuries, ranging from the elegant dance forms of the European Courts to the social dances of but a few generations past in America. “Living History Demonstrations” include animal husbandry (featuring sheep from Red Rope Farm), blacksmithing, butter churning and cheese-making, candle making, colonial herbalist displays, lacemaking, spinning, weaving, sewing and tape weaving. On May 7, Frecon’s Cidery ( 209 Edgehill Drive, Boyertown, http://freconswassail.com) is hosting a special springtime event — Frecon’s Wassail. The event is the cidery’s annual outdoor celebration of the timeless European tradition of wassailing. “Wassail” is a term that has evolved throughout history but early Englishmen used the term as a simple greeting. Eventually, “wassail” was used as a toast in ritualized drinking. Today, the term means more of a hail to a healthy and fortunate harvest. People in the act of ‘wassailing’ will sing and drink to awaken the cider apple trees, scare away evil spirits in the orchard and toast the health of the trees to ensure a plentiful harvest of fruit in the fall. The Wassail at Frecon Cidery will present live entertainment throughout the afternoon — Cider House Blues Band at 12:30 p.m., Manatawny Creek Ramblers at 2:15 p.m. and Lazy Afternoon at 4 p.m. Some of Frecon Cidery’s featured hard ciders will be The Crabby Granny, The Early Man and The Hogshead. There will also be non-alcoholic cider available. Tickets are $10 in advance and $15 at the gate. Children under 15 are admitted free. Frecon’s Cidery’s Wassail will be held outdoors under tents — rain or shine. There will be no refunds in the event of inclement weather. 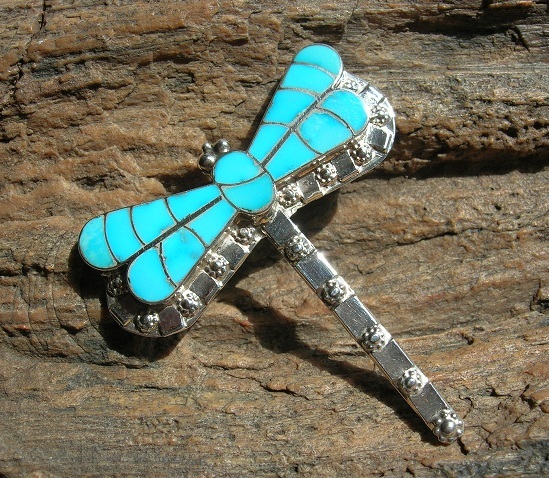 The Greater Philadelphia Expo Center is hosting the Americana Indian Art & Jewelry Show this weekend. From May 6-8, The Greater Philadelphia Expo Center (100 Station Avenue, Oaks, 484-754-3976, www.phillyexpocenter.com) is hosting the Americana Indian Art & Jewelry Show. An always-popular motif for home decorating is American Indian art — especially artwork produced in the American Southwest. This weekend, you can find a lot of examples of this art style at the Americana Indian Art & Jewelry Show on Oaks. There will be a number of small festivals in Philadelphia this weekend that are worth making a trip to the city. The Opening Weekend Celebration at Spruce Street Harbor Park is scheduled for May 6 and is free. Named one of the best places to visit in Philadelphia by national press, Spruce Street Harbor Park features colorful hammocks, floating gardens, beautiful lights, refreshing craft beer, and food from popular Philly restaurants, making it a summer gathering space for locals and visitors alike. More than 50 colorful handmade hammocks are strung throughout the park to create a relaxing place to spend summer days and nights. Located in the Marina at Penn’s Landing, the Oasis consists of three landscaped barges, a net lounge, and floating gardens. 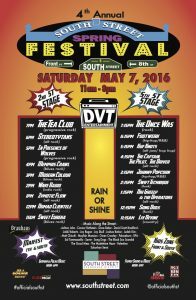 The annual South Street Spring Festival (http://southstreet.com ) will close down South Street from Front Street to Eighth Street on Mat 7 from 11 a.m.-8 p.m. The free festival will feature food, music and a variety of family activities. Live entertainment will be provided all day with a line-up of approximately 20 music acts, including The Once Was, In Presence of Wolves, Kuf Knotz, Wave Radio, Memphis Crawl and Song Dogs. Affiliated events in the area on Saturday include the First Annual Philly Taco Eating Contest, the Second Annual Atomi-Con and Maifest at Brauhaus Schmidtz. On May 7, the Pan Asian Society of Greater Philadelphia is hosting the 10th Annual Asian Pacific American Heritage Celebration. The event features a wide variety of food and live performances along with a children’s fair and other international entertainment. The family-oriented event will take place outdoors from 11 a.m.-5 p.m. at Franklin Square (200 Sixth Street, Philadelphia, http://www.panasianphila.org/news.html). Admission is $7. The Art Star Craft Bazaar is an award-winning retail art/craft show that is organized and juried by Art Star. The show has become a shopping tradition for residents of the Delaware Valley and attracts thousands of visitors annually. The free event will run from 11 a.m.-6 p.m. on May 7 and 8. And, it will be held rain or shine. Also on May 7, Cliveden, a historical home in the northwest outskirts of Philadelphia, will host the 46th Annual Mt. Airy Day from 11 a.m.-5 p.m. The live entertainment line-up features C.W. Henry School Choir, Settlement Music School, Mt Airy Performing Arts, Dukes of Destiny, Free to Be Dance Academy and Boyler Boys. The 2016 Yellow Springs Art Show is coming down the homestretch. If you want to check it out, you had better hurry. The show is running now through May 8 in Historic Yellow Springs Lincoln Building (Art School Road, Chester Springs, 610-827-7414 or www.yellowsprings.org). Show hours are from 10 a.m.-4 p.m. daily. The event, which is still free and open to the public, features more than 185 participating artists — including 23 artists who are new to the show this year. Other ongoing events that you don’t want to miss this spring are the Chinese Lantern Festival in Philadelphia and “Spring Blooms” at Longwood Gardens. As part of Historic Philadelphia’s 10th anniversary celebration at Franklin Square (200 Sixth Street, Philadelphia, www.historicphiladelphia.org ), the organization is illuminating the park with its inaugural Chinese Lantern Festival. Japanese Wisteria is the featured flower in bloom right now. Japanese wisteria is highly prized for its very long, fragrant racemes of flowers in spring. Longwood’s decades-old wisteria vines are a spectacle of their own. May 6 is National Public Gardens Day — a day that celebrates public gardens’ important role in providing beauty and respite to more than 70 million people annually, while also promoting environmental stewardship and awareness, plant and water conservation, and education in communities nationwide. Longwood Gardens will have a National Public Gardens Day celebration from 11 a.m.-3 p.m. Participants are invited to join the Longwood staff and discover how the site’s expert horticulture staff designs and grows the displays — from colorful inspiration to careful planning, from plant care to the final dazzling horticultural display. Visitors can go behind-the-scenes to Longwood’s Production Greenhouses where ordinary plants are made extraordinary through the exceptional skill of the highly-experienced staff.